Watermelon is an iconic summer treat. Grown all over Florida, it is grown as far north as Jackson County and as far south as Collier County. 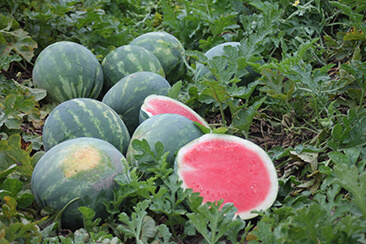 The Sunshine State has been home to watermelon production since the 16th century. According to the United States Department of Agriculture, in 2017, Florida produced more than 20,000 acres of watermelon. Watermelon is a refreshing and nutritious treat. The fruit gets its name from its high water content. It has 92 percent water content. Watermelon is packed with fiber, protein, vitamins, minerals and lycopene. It can be effective in reducing body temperature and blood pressure. Enjoy this recipe for a fresh summer salad from Allrecipes.com. In a small bowl, whisk together the honey, lime juice, olive oil and pinch of salt and set aside.